New, 8/10/07: With the introduction of iWork '08, which includes the new Numbers spreadsheet, it appears that ClarisWorks, aka AppleWorks, is finally dead. There has been no official cancellation announcement, but AppleWorks no longer shows up under the list of software titles on the online Apple Store, and perhaps more significantly, http://www.apple.com/appleworks now redirects to http://www.apple.com/iwork. Active development on AppleWorks evidently ceased some years ago, but the program continued to be sold. RIP ClarisWorks, "the best-loved application for the Mac", 1991-2007. Note: this page was written in early 2003. This page is now also available in French, thanks to Stéphane Ascoët. This is my little tale of adventure in Silicon Valley. I hope you find it entertaining. This page is about the history of ClarisWorks (now called AppleWorks). 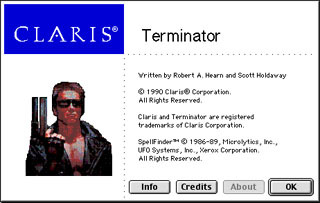 ClarisWorks was one of the most popular Macintosh programs of all time, with over 20 million active users at one point. If you haven't heard of it, you will likely not find this page particularly interesting! A lot of the material here is rapidly becoming ancient history; I thought I had better set down as many recollections as I could, before everybody forgets ClarisWorks completely. There seems to be a lot of confusion surrounding the relationship of the various programs named AppleWorks and ClarisWorks. This is not helped by the fact that Apple renamed ClarisWorks to AppleWorks a couple of years ago. In fact, there have been three completely different programs known as AppleWorks. This history is not about the first one, which was a text-based program for the Apple II. People also seem to confuse Claris the company and ClarisWorks the program. In fact, Claris was around long before ClarisWorks, as explained below. It all started with a little software company in Houston called StyleWare, run by Kevin Harvey. StyleWare made Apple II software (MultiScribe). In 1986, Apple introduced what looked to be an interesting new computer: the Apple IIGS. It was an Apple II that acted like a Mac! StyleWare hired a bunch of computer science students from Rice University to write software for this new machine. Among them were myself, Jeff Erickson, Scott Holdaway, Scott Lindsey, Tom Hoke, Mike Hibbetts, and Syd Polk. (This was a natural job for me - I had been an Apple enthusiast and programmer since 1977, when I got my first Apple II.) Jeff and I wrote TopDraw1, which was like MacDraw. Originally to be called ColorDraw, TopDraw was the first color object-oriented drawing program for a Mac-style graphical user interface. The Mac II had not yet arrived; Macs were black and white. Our main programming effort at StyleWare became an integrated application for the IIGS, to be called GSWorks. This would have word processing, graphics, spreadsheet, etc. This turned out to be a very difficult undertaking - the IIGS was not really a powerful enough machine to support its color graphical UI, and GSWorks was a very large and complicated program. The Macintosh was an 8 Mhz machine with a 1-bit display; the IIGS was a 2.8 MHz machine with a 2- or 4-bit display. Furthermore, at that time application software for the IIGS had to be written in assembly language. To help tackle this project we added a few more programmers (including the notoriously bathrobe-clad Ian Mitchell). By late 1988, AppleWorks GS was ready to ship. Well, ready or not, it was shipped2. The plan at this point had been to reorganize the StyleWare team around a project to write an integrated application for the Macintosh. This would compete against Microsoft Works - a daunting prospect, even in 1988. Apparently Claris decided it was too daunting; after we finished AppleWorks GS, the plan was changed. The StyleWare programmers were distributed throughout the other Mac projects. Scott Holdaway wound up on the MacWrite II team; I was on the MacDraw II team3. In spite of the change of plans, Claris was in many ways a great place to be. It had inherited some Apple culture, which appealed to me, and there was a strong sense that we were creating the best, cleanest software out there. Years later I realized that this feeling had led to a certain blindness to the pace at which the rest of the industry was moving. In its effort to produce slick, bug-free software, Claris was neglecting the hard reality that sheer number of features sells, independent of elegance of design. Some products, such as MacWrite Pro, were delayed so long by stringent quality assurance requirements that they lost their effectiveness in the market. Eventually, in April 1989, Scott Holdaway and I decided that our jobs were not what we'd had in mind when we joined Claris: we wanted to write new software, not maintain old software. So, we left Claris to form our own company, Spartacus Software, which would create the Mac integrated application. Almost everyone at Claris told us we were crazy: how could two programmers on their own compete against Microsoft? The one exception was Yogen Dalal, VP of Engineering. He thought we had a good chance. Claris gave us some equipment in return for the right of first refusal if we wound up selling our company. (This turned out to be a great deal for Claris.) Spartacus' "seed capital" amounted to about $10,000. I remember picking up our computers from the Apple store like it was yesterday. It was incredibly exciting. The two of us were about to take on Microsoft, and we knew we could do it! Scott and I had made a little money from the StyleWare sale, and my (by then) wife Liz had a job as a geologist, so we could last for a while on our own. For the first couple of months we had our computers (16 MHz Macintosh IIx's) set up on card tables in the dining room of Scott's apartment; this is where ClarisWorks was born. 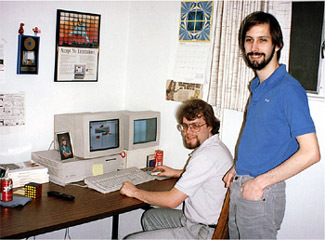 (We wanted the program eventually to be sold as MacWorks, but early versions were called BSWorks, for Bob & Scott.) We rented a house together in Santa Clara to save rent; this was Spartacus' headquarters. Things went well for the first several months. We settled on a very nice overall architecture for the program. All "integrated software" to date was effectively several separate programs, loosely stitched together. For multiple reasons we had to do better than this. First, to do something new and interesting. Second, two programmers cannot write a competitive stand-alone word processor, spreadsheet, graphics program, and database program in a year or so. Third, application size was a big deal in those days: Microsoft Works was a big program; we wanted to do better. We came up with a frame-based approach. Most of the functionality particular to the various application types was packaged up into "frames": word processing frames, graphics frames, etc. These frames were then used as building blocks to make documents of the appropriate types, in a unified programming framework. E.g., a word processing document was essentially a bunch of text frames, one per page, linked together. (Doing this neatly was a big challenge - many subsequent efforts at building a component-based architecture (e.g. OpenDoc) have failed to take into account the top-level user interface requirements.) The result was that not only was most of the code shared across the document types, but the application was also truly integrated - the frames could be embedded in each other. E.g., you could plop a spreadsheet frame right into your word processing document. Text objects in a graphics document had a full-featured word processing engine behind them. 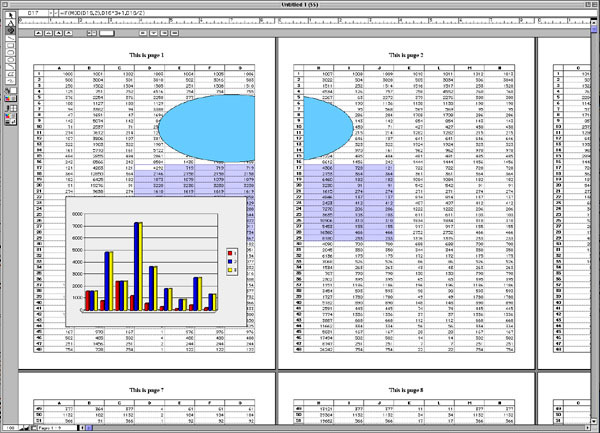 The database form editor used the built-in graphics environment. Etc. One related cool thing we had was a "shared graphical context" mechanism: sometimes, stuff would wind up being displayed in multiple frames at once. E.g., maybe you're dragging an object across a page break in a document with multiple pages (like this). We developed a general architecture for displaying actions live in multiple contexts. Of course, a lot of this kind of stuff is old hat today, but it was new and exciting in 1989. Some creative programming was required to do these things efficiently on the hardware of the time. Our work was interrupted in October by the Loma Prieta earthquake. This was the magnitude 7.1 quake that interrupted the world series. Having lived in the bay area for a few years, I'd been through several quakes, but nothing had prepared me for this one. I was sure the house was going to collapse. Of course, it didn't. By around November, we had made great progress - all the document types were more or less functional. Scott had done most of the word processing code, I'd done graphics and most of the overall framework, and everything else we'd both had a hand in. There was a lot of work left to be done, but we figured it was time to start shopping the program around. We didn't want to be unemployed forever. We had wanted all along to take the program back to Claris, and finish it with our friends from StyleWare. We gave the Claris execs a demo, and they were impressed. Around about then Claris decided that it really did make sense to be in the Mac integrated market after all. They would buy either us, or a competing effort called SmartWorks. They preferred our program. But when it came time to talk numbers, things didn't work out. Claris said "we'll give you X"; we'd had in mind more like 6X. Maybe we were greedy - X wasn't bad for less than a year of work. But we had written it, it was ours, and we thought it was worth a lot more. And of course, Claris had first rights of refusal (meaning they had the right to match any other offer) - they had nothing to lose by letting us shop it elsewhere. This is a letter we sent to Steve Jobs at NeXT. So we tried to. However, there are things called proper channels, and we didn't have them. We sent letters to Steve Jobs at NeXT, to Aldus, to Ashton-Tate, and others. (Offering the program to Microsoft is something we would never have done.) Without exception nobody returned our letters or our repeated calls. We had a great program, and we knew it, but no way to get it out there! We had no resources to produce and market it ourselves. Yes, we were a bit clueless; there were no doubt plenty of venture capital opportunities, and agents available who did have the connections to get us in the door at the big software companies. (But remember this was well before Silicon Valley dotcom culture.) Eventually we found both. For a tense few months, however, the future looked bleak. The winds had changed again at Claris; they were no longer sure they wanted an integrated application. Nerves frayed. Somehow, we managed to keep the effort going, and avoid tearing each other's throats out. Then one day we got a call from Kyle Mashima, who had been a marketing executive at Claris when we worked there. He knew about us, and had left Claris to join a venture capital firm. He arranged a demo for Guy Kawasaki (former Apple evangelist, former president of ACIUS4). Guy came over to our house, we gave a demo, and he loved it. He said, "Why don't you guys move into my office in Palo Alto. I'll move into my wife's office, across the hall." Seriously! This was way cool. Everybody knew who Guy Kawasaki was. We'd read in the Mercury News a couple of months earlier that he had left ACIUS; there was rampant speculation on where he'd go next. We'd joked that we should get him to be the president of Spartacus. That was now a distinct possibility. However, there were other options to consider; Kyle had agreed to act as our agent in offering our program to various companies. The next couple of months were a whirlwind of demos and crunch development. We did indeed move into Guy's office, rent free - literally, he moved out, across the hall. (He left up his Porsche posters to help keep us motivated.) At the same time we were looking for buyers, we were scoping out the possible structures for our own company that would actually produce and market our program, with Guy as president and Kyle as VP of marketing. This was an exciting time, a complete turnaround from the recent depths of despair. We were living every Mac hacker's dream. It would have been a great adventure to start the company with Guy and Kyle, but in the end, the competitive offers we started getting made Claris sit up and take notice. Claris wound up offering us everything we'd wanted, and more; it was impossible to refuse. This was our chance to rejoin the StyleWare crew, and have the Claris stamp of quality on our work. (Guy and Kyle weren't left out in the cold - they received an agent's fee. Guy now runs Garage Technology Ventures, and Kyle is now VP of strategic development at Adobe.) I'll always wonder how it would have turned out had we taken the other course. In July 1990, we sold our program to Claris. Claris corporate headquarters: "The Wedge". At this point things were going great, but there were still a few speedbumps on the road to a successful shipping product. As mentioned above, Claris never went public. Right after Claris bought Spartacus, Apple decided to keep Claris as a permanent subsidiary. This was not in line with the expectations of the executive staff at Claris. Shortly after we arrived, Claris' president resigned. Over the next year, most of the executive staff also left. The general turmoil complicated all activities at Claris. We were joined by StyleWare programmers Tom Hoke and Scott Lindsey in our effort to finish the product, now code-named "Terminator" (because that's what we were going to do to Microsoft Works). Mate Gross, who had been a tester for AppleWorks GS, headed up the Terminator test team. On the marketing side, Bob Lisbonne joined as product manager. ClarisWorks would not have become the product it did without the hard work of these and many other talented people at Claris. The actual product name had yet to be chosen. In line with MacWrite, MacDraw, etc., we wanted our program to be called MacWorks. But that name belonged to a program that let Lisas emulate Macs. (The Lisa was the ancestor of the Macintosh.) Also, Claris wanted to get away from the "Mac" names, because producing Windows versions of their products was a future possibility. For a while "FireWorks" was the leading candidate, but that name was owned by someone who had some fire station-management software; he was unwilling to part with the name5. "Revolution" was also an option. In the end "ClarisWorks" was chosen, more by default than anything else. I'll skip most of the details of the next year and a half, which is how long it took to finish ClarisWorks after we sold it to Claris. This was far longer than we had planned. Some of this was due to adding features, some to Claris' stringent quality assurance, and some simply to misestimation of the amount of work required. Suffice it to say that we worked long and hard. Towards the end of this period it became critical that we ship a product soon. We weren't the only ones trying to shoot down Microsoft Works. There were also SmartWorks (the program Claris didn't buy) and BeagleWorks. SmartWorks had been bought by Symantec (who had also been very interested in Spartacus), and relabeled as GreatWorks. BeagleWorks was another integrated product, put out by Beagle Bros. All three were due out at around the same time, to take advantage of Apple's newly-introduced lower-cost Macintosh models. These were the Mac Classic, the Mac LC, and the Mac IIsi. All were less expensive than the existing Mac II line, and targeted at education, which was also a big part of our target market. These machines shipped in configurations with only a megabyte of RAM; achieving acceptable performance on these models was a major technical requirement for ClarisWorks. Finally, ClarisWorks 1.0 was certified golden master in October, 1991, and began shipping to the public. Initial reviews were positive, and sales began to take off. Liz and I celebrated with a trip to Hawaii, where I was thrilled to see ClarisWorks on the shelves in the computer stores. ClarisWorks quickly surpassed Microsoft Works in sales and popularity. Early in 1992, Microsoft shipped a new version of Microsoft Works, with the claim "Best-Selling Integrated Application for the Macintosh" on the cover of the box. Claris Legal forced them to remove this inaccurate text. (Microsoft initially objected that Claris' sales numbers were based on copies of ClarisWorks bundled with Macs, but in fact retail sales were also better than Microsoft's, in number and in revenue.) For once, Microsoft had been beaten in the marketplace, in a category in which it had been dominant. 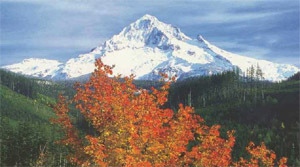 Mount Hood: one small slice of Oregon beauty. After ClarisWorks 1.0 shipped, Liz and I moved to Portland, Oregon. Why? Liz had grown up nearby, and each time we visited her family there, it was harder to leave. The Pacific Northwest is really a wonderful place to be, in countless ways. We also wanted to get away from Silicon Valley high prices and crowds. (Of course that's hard to believe, in retrospect - houses in the bay area now cost many times what they did in 1992.) We had a dream that Claris would relocate the entire development team to Portland; the other team members were amenable. But I was under no illusions that Claris would see fit to open an office in Portland. However, when it came time to negotiate the terms of the contract for ClarisWorks 2.0, Scott put his foot down: no Portland office, no contract. Claris gave in. In the end we had to settle for Vancouver, Washington, which is just across the Columbia river from Portland. Liz and I bought a house there, the whole development crew moved to Vancouver, and ClarisWorks 2.0 started to take shape. In due course we finished ClarisWorks 2.0. Sales were still strong, and ClarisWorks was winning lots of awards. At least according to one Claris marketing presentation I saw, ClarisWorks was outselling Microsoft Office (presumably by units, not revenue). For a couple of years, ClarisWorks was a $100 million product. Now it was time to think about 3.0, but by this time the down side of moving to Portland began to manifest itself. Claris management had continued to turn over, and Scott and I no longer had any close ties with the latest management team. By isolating ourselves, we had freed ourselves from a lot of the daily hassles we'd had in Santa Clara; this let us focus on programming. But in reality, losing contact was too high a price to pay, both for the development team as a whole, and for Scott and me personally. We had a hard time negotiating the contract for ClarisWorks 3.0. Development on 3.0 did not go particularly smoothly. Claris needed a new version on the market before all the features were ready, and shipped a version with a small number of feature upgrades as 3.0, against Scott's and my wishes. The feature set we had agreed to eventually shipped as ClarisWorks 4.0. By the time ClarisWorks 4.0 shipped, Claris' vision of the future of the product was too different from mine for me to continue working on it. One thing required was integration with OpenDoc, which necessitated a massive restructuring of the program. OpenDoc was designed to tackle a lot of the same problems that ClarisWorks tackled, and each project had its own ideas and metaphors for component integration and interface architecture. The two directions were not particularly compatible. I left after 4.0 to pursue other interests; Scott and the rest of the development team stayed on. Before ClarisWorks 5.0 was finished, the rift between Claris and the remaining development team grew too wide. Scott Holdaway, Tom Hoke, Scott Lindsey, Bruce Hammond, and Carl Grice left Claris, and formed what would later become Gobe Software. These were the core engineers, the ones who had been on the project the longest. Several newer engineers remained. Three in particular were responsible for OpenDoc integration. At Apple WWDC '96, they demoed a version of ClarisWorks with OpenDoc support. Apple was particularly eager to demonstrate to developers that a flagship product was supporting the new component technology - ergo, everyone else should too. Not surprisingly (to me, anyway), the following week the three engineers were recruited by Microsoft. Result: no OpenDoc support in ClarisWorks 5.0. That maneuver is just one typical example of the way Microsoft stifles competition. Ironically, in this case it hit a product conceived in defiance of the Microsoft way. In January 1998, Claris Corporation ceased to exist as such. ClarisWorks was brought directly into Apple, and renamed AppleWorks. What had been Claris now became FileMaker, Inc. In March 2000, Apple released AppleWorks 6.0. This was widely perceived as a very minor update, with several problems (e.g. removal of several file translators). Here is a letter I sent to MacInTouch and MacFixit at the time. Meanwhile, the guys at Gobe (whom I had since joined) were working on Gobe Productive. This product was the next logical step beyond ClarisWorks, with a more open architecture, but written for the Be operating system (BeOS). There is an interesting back-story here. When Gobe was founded, in late 1996, speculation was widespread that Apple would buy Be, and BeOS would become the basis of the next Mac OS. Thus, Gobe would have a leg up on development for the new platform. However, Apple surprised everyone by buying NeXT instead of Be. NeXTStep became the basis for Mac OS X, and the writing was then on the wall for Be, although most of us refused to read it. BeOS did not survive in the marketplace; thus, neither did Gobe. At times over the past few years, there have been rumors and speculation that Apple was working with / had reacquired Gobe and / or the original ClarisWorks team, to produce a new Mac version of AppleWorks based on Gobe Productive. Apple and Gobe did indeed discuss possibilities at various points in Gobe's history; however, I am not at liberty to go into details. Apple did not in the end acquire Gobe as such, but three of its founders, Scott Holdaway, Scott Lindsey, and Carl Grice, did rejoin Apple as employees when Gobe failed. They won't tell me what they are up to (even off the record! ), but whatever it is, it does not involve the Gobe Productive codebase. Nor, I am reasonably sure, does it involve the ClarisWorks / AppleWorks codebase. As for myself, I went back to grad school, to study artificial intelligence at the MIT AI lab. (Ironically, although I dragged the team to Oregon, and I was always the most die-hard Apple enthusiast of the bunch, I'm now the one who's left Oregon, and Apple. I miss them both!) I'm depressed at the lack of progress AppleWorks has made over the past few years (although I still use it on a daily basis), and I wish I had found a way to keep it moving forward. I also wish there were an alternative, that had the simplicity and tight integration we spent so much effort crafting into ClarisWorks. I can think of nothing I'd rather do than help create a modern version of ClarisWorks - except finish my thesis! Here's hoping others can carry the torch forward. Please especially let me know if you remember some important part of ClarisWorks history I've forgotten to mention, or misremembered. 1 An unrelated program for NextStep was later also called TopDraw. Our TopDraw eventually became BeagleDraw; when Claris bought StyleWare, everything except GSWorks was sold to other companies. Those who are excessively nosy or observant might have noticed that the ClarisWorks file creator ID is BOBO. Why BOBO? This is actually related to TopDraw. When Jeff and I sat down to spec out TopDraw, we played around a lot with MacDraw. One excessively silly creation (aided by my wife, Liz) was "My Dog Bo-bo". Alas, Bo-bo has been lost in the depths of time, but he lives on in every ClarisWorks file. 2 For more about the history of AppleWorks GS, see Gareth Jones' Life and Times of AppleWorks GS . 3 During this period, a new hire joined the graphics group: Pierre Omidyar. He would later go on to found eBay. Pierre and I frequently bounced software design issues off of each other; I think those discussions were useful to me later when designing ClarisWorks. 5 He must have sold the name eventually - now, of course, Fireworks is a web graphics program, by Macromedia.